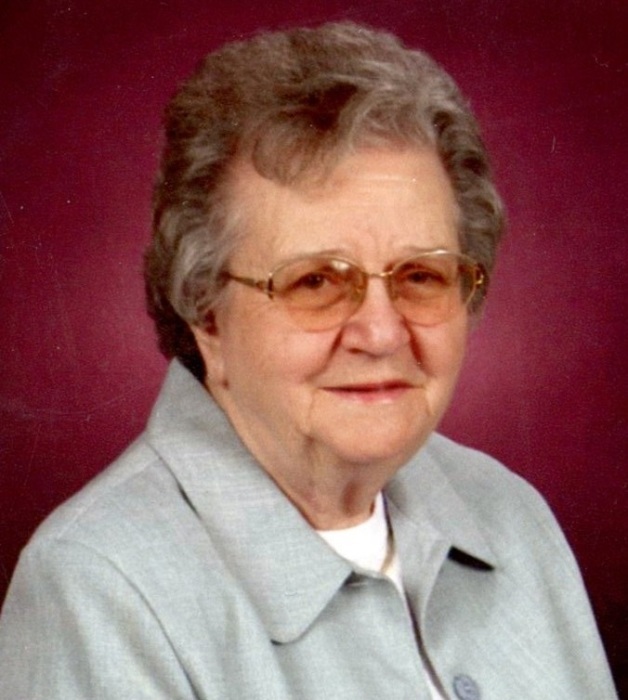 Nonnie B. Osburn of Springfield, IL died at 6:01 a.m. on Monday, March 25, 2019. Born on March 23, 1923 in Dongola, IL, as the only child of Roscoe and Mary Karraker, she married Gene O. Osburn of Mc Leansboro, IL in September of 1951. He preceded her in death on January 20, 1997. She is survived by son Keith D. Osburn of Chatham IL; daughter Karen E. Osburn of Springfield, IL; granddaughter Kristen R. Osburn-Miller (husband Kevin Miller) of Independence, KY; granddaughter Gina N. Osburn of Rochester, NY; and her great grandson Eric Anthony Miller. She was preceded in death by her parents, husband, and daughter-inlaw Mary Ann CastelonOsburn. Nonnie was a member of the Church of Christ in Dongola, IL, where she started the first Sunday School Class for children. She later transferred her membership to South Side Christian Church in Springfield. Nonnie and the Osburn family started attending church there in 1961. She would often help with the Senior outings hosted at South Side; including senior luncheons and Bob’s Trips. She was a graduate from SIU with a master’s degree in Education and Administration. She started her teaching career in Dongola, IL. She later taught in Decatur, IL, before moving to Springfield where she taught for District 186 for a total of 34 years; spending most of those years at Ridgely Elementary School. While at Ridgely, she trained many student teachers from various universities. Her fourth and fifth grade students admired her and many of her student teachers would emulate her in their careers. Nonnie was best known as an excellent supporter of her family and friends. She joined her husband and children in their love of fishing and camping. When her daughter obtained her first show Dachshund, she became an avid supporter of Lincolnland Dachshund Club. When her granddaughters took up the sport of figure skating, she joined the Springfield Figure Skating club. She also spent time improving her career through course work, travel, and organizations such as PTA, SEA, and RTA. She could often be seen supporting the Illini basketball games as both her son and oldest granddaughter attended school there. Memorial contributions may be made to Springfield Public Schools Foundation at 1900 West Monroe, Springfield, IL 62704. Ellinger-Kunz & Park Funeral Home at 530 N. 5th Street in Springfield, IL is in charge of arrangements. Friends may call from 9:00-11:00 Thursday morning, at which time service will be officiated by Rev. Brooks Wilson from South Side Christian Church with prayers by Rev. Robert Green. Interment will be at the Chatham Cemetery, immediately followed by a luncheon at South Side Christian Church (2600 S. MacArthur Blvd., Springfield, IL).